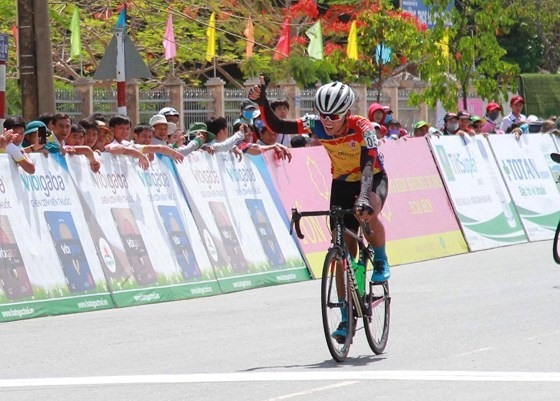 HÀ NỘI — Nguyễn Nhật Nam finished first at the eighth stage of the Return to the Countryside cycling tournament to take the yellow jersey off the leading athlete yesterday. Nam of Domesco Đồng Tháp made an outstanding solo in the last 40km of the 101km stage from Bến Tre Province to Kiến Tường Town in Long An Province with a time of 2hr 25.22min. Rex Luis Krog of the Philippines’ Go for Gold came second and his teammate Ismael Grospe Jr was third. Nam’s remarkable performance not only brought him the stage win but also pushed him to top of the overall ranking. He replaced Quách Tiến Dũng of the Military Zone 7 who held the yellow jersey from the fourth stage. Dũng dropped to No 2, followed by Nguyễn Phạm Quốc Khang of Bike Life Đồng Nai. In the team ranking, leading Gạo Hạt Ngọc Trời An Giang have created a gap of 1.19min to the nearest team of Bike Life Đồng Nai. At the third position is Go for Gold.